While the MP from Arunachal Pradesh did not claim that the child in the video was Indian, he did not clarify either. Minister of State for Home Affairs Kiren Rijiju baffled Twitter users over the weekend with his tweet that included a video of Brazilian football prodigy while praising Prime Minister Narendra Modi’s efforts for encouraging the development of sports in India. The video shows a nimble-footed young boy dribbling a football in a long and impressive volley that keeps the ball from touching the ground. While the MP from Arunachal Pradesh did not claim that the child in the video was Indian, he did not clarify either. Rijiju said the prime minister had laid a lot of emphasis on sports particularly football. He also said the Indian team’s performance had improved in recent times and that younger generations were showing more interest. The minister’s tweet got over 7,000 Likes and over 350 comments from many Twitter users pointing out that the child was not from India. The boy in the video is six-year old Marco Antonio from Brazil. 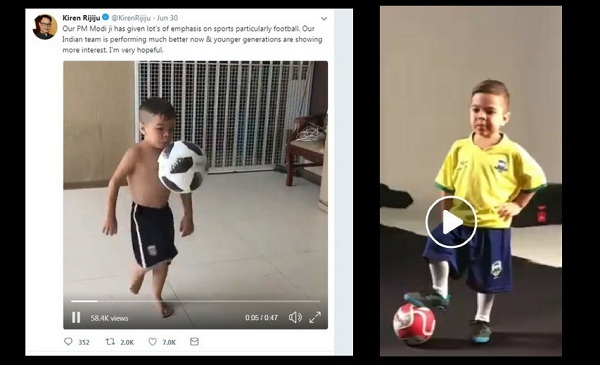 Marco, known affectionately as “Marquinho” or Little Marco, became an internet sensation when his parents posted a video of him practising when he was five. The video shows a tiny Marco display dribbling skills that takes years to master. Marco’s parents say he learnt to play football when he started walking. However, in Marco’s life is far from being a breeze as he suffers from a chronic inflammatory bowel condition – Crohn’s disease. Marco’s parents say that his dream is to play for Brazil and that he will overcome his condition to achieve his goal. He is already being dubbed as the next Neymar in Brazil. India, currently ranked at 97 in World FIFA rankings, re-entered the top 100 league in March this year. The country’s ranking had touched an all-time low of 166 in the world in 2015 but steadily improved over last three years to reach their highest ranking in recent years. India is ranked above Qatar who will be hosting the 2022 FIFA World Cup.